Head of the module — Alchinbaev Myrzakarim Karimovich, MD, Professor, Director of the Scientific Center of Urology them. 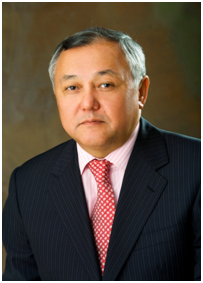 B.U.Dzharbusynova, Chairman of the Scientific Society of Urology Kazakhstan, member of the European Association of Urology and the World Association of Urology. 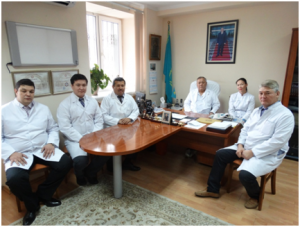 For the first time in Kazakhstan urology unit was opened on the basis of ASMI in 1940. Its first director was V.V.Zikeev. From 1955 to 1969 unit led by Professor Z. Fanshteyn. In 1971-1975gg headed by Professor EP Eganov. From 1976 to 1996 headed by professor of urology unit BU Dzharbusynov. Over the years, the faculty urology unit represented by leading urologists of the Republic of Kazakhstan. Currently, the staff of the module are 3 professors and 4 candidate of medical sciences. Clinical base module is the Scientific Center of Urology im.B.U.Dzharbusynova. According to the leadership of MK Alchinbaeva Scientific Center received several awards for «Best clinic №1 in the Republic of Kazakhstan» (2011), «The best social project in the Republic of Kazakhstan — The» Men’s Health «(2011). At present, the scientific direction is carried out in the implementation of scientific and technical grant MES «The development of new approaches to endoscopic therapy of bladder leukoplakia» of 2013-2015., «Development and implementation of modern approaches of molecular genetic and immunological methods for early diagnosis of prostate cancer education» 2013-2015,. and the republican program «Early detection and prevention of prostate cancer.» and the republican program «Early detection and prevention of prostate cancer.» The Centre has introduced new technology, which led to the development of a fundamentally new diagnostic and treatment tactics in the vast majority of urological diseases. Use an arsenal of the most modern and advanced diagnostic techniques. In such pathologies as urolithiasis, benign prostatic hyperplasia, cystic kidney disease treated patients in 90-95% of cases is carried out using the new minimally invasive medical technologies. These measures have contributed to a significant expansion of the scope, significantly improving the quality of tertiary care to the population while reducing the proportion of traumatic open surgery, reducing the number of complications, shorter hospital stay. In NC Urology im.B.U.Dzharbusynova trained students, interns, residents, students.